*Weight loss results may vary and are different for each individual, you must attend a consultation to determine suitability. What's included with your MEDIWEIGHT? 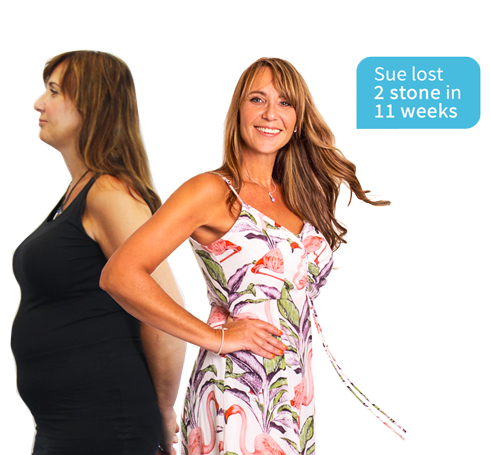 Created by doctors, MEDIWEIGHT is a proven weight loss and body transformation programme. It combines a flexible, easy-to-follow eating plan – that won’t leave you hungry or bored – with specialist treatments that break down stubborn fat and tighten skin. And it really works: most MEDIWEIGHT patients lose 6-12kg (13-26lbs) per month. "How can I ever thank you enough! just heard your message now and am so grateful to you! You really are the most wonderful, special and caring person. I mean it when I say that I will never ever forget your care and kindness. Thank you again for never giving up on me! I am beyond excited and motivated to start again! I can come on Wednesday and I thank you so much for organising everything for me! I will call the clinic tomorrow to confirm everything and I will call you to thank you personally. I am on my way to the theatre with the children now, otherwise I would have called you now. Thank you so so much again. MEDIWEIGHT is so lucky to have you and I would love to write a letter about you on the website so that people are aware of just how special you are! Thank you again." Courthouse Clinics have been delivering award-winning, doctor-led cosmetic treatments throughout the UK since 1998. We believe that a doctor-led programme is the best way to safely reach – and maintain – your ideal weight. Lose weight with MEDIWEIGHT, today! With MEDIWEIGHT you will not have to starve yourself or spend hours at the gym. MEDIWEIGHT is a doctor-led weight loss programme consisting of a medically-devised diet, bi-weekly treatments to break down stubborn fat and tighten skin, plus continual support and advice from qualified doctor. The MEDIWEIGHT programme begins with a one-to-one consultation with a specialist doctor, who will determine your suitability and then schedule weekly visits to assess your progress. The diet features a varied range of tasty and filling meal replacements, plus a selection of fruits and vegetables. As the diet – and your weight loss – progresses, you will gradually reduce the meal replacements and resume a healthy, normal diet. Each week in clinic you will enjoy two specialist body contouring treatments: Endermologie (to break down stubborn fat deposits); and Accent (to tighten loose skin). Simply repeat steps 1-3 until you have reached your goal weight and feel confident enough to maintain it without MEDIWEIGHT. The diet is broken down into 8 stages. In Stage 1 you will begin by eating 5 food sachets a day accompanied by a permitted vegetable allowance. You will also come in to clinic for a weekly 60-minute treatment session to improve the contours of your body and tighten your skin as you lose your weight. As you progress through the therapy you will require less food sachets as more food groups are introduced. Eventually you will be completely dependent from MEDIWEIGHT, having reached your goal weight and with a better understanding of what is required for a healthy lifestyle. MEDIWEIGHT costs vary but we can estimate how much you'll pay based on an average price. See below for our excellent payment plans to help you reach your goal weight without stretching your purse strings! MEDIWEIGHT costs £250 a week on average, call us for your personalised quote! Losing weight and keeping it off can be incredibly difficult, but with the combination of medically devised meal plans and body contouring treatments, MEDIWEIGHT has made the process a whole lot simpler. You can stand to lose a stone a month but this is no temporary fix, nor does it involve meal-replacement shakes or hunger – just is a longterm plan for rapid weight loss that will inspire healthier habits for the rest of your life. The treatment is comprised of four essential elements: ultrasound therapy, connective tissue massage, medical diet and stabilisation. Along with the help of a doctor providing personalised advice and support, MEDIWEIGHT is the perfect weight loss programme for anyone wanting to change their life for the better. At Courthouse Clinics, we have an entire staff of medical professionals ready to help you achieve your health and weight loss goals. Following a thorough medical history and physical examination, we will be able to devise a detailed treatment plan based on your current health and weight loss goals.